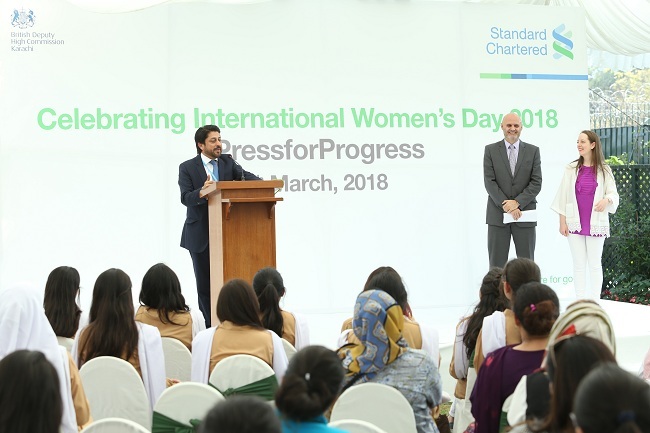 Standard Chartered under its Diversity & Inclusion platform joined hands with British Deputy High Commission and celebrated International Women’s Day. The Bank along with British Deputy High Commission organised short master classes which were conducted by leading women and men who were specialists in their areas. These master classes were attended by 100 girls from O and A levels of leading schools in Karachi. The concept was to enlighten the girls and give them access to successful professionals who can talk about their leadership and professional development journey to them. As the Bank aspires to be a leader in gender diversity, supporting women in the workplace, as customers and in the community, Standard Chartered remains committed to be ‘Here for good’ in the markets where it operates, and is determined to make a difference not only to help women fulfil their potential as leaders in the Bank, but to also play a critical role with its clients and communities in supporting and furthering the role of women in every society, including Pakistan. 2018 is a year for #Pressforprogress and our vision it to create an environment, for women, be it at work or in our communities, where talents and individuality are valued and respected.